This epic voyage is named for for the legendary sea monster, The Kraken. The Kraken is fabled in Norse lore to have devoured entire ships, with arms longer than a ship's mast was high. Aboard this authentic pirate ship Buccaneer Queen, featured in many television commercials and movies, you'll sail the high seas in search of today's giants of the deep, Cabo's famous grey whales, which migrate to the Sea of Cortez every winter to calve. On board your Spanish Galleon, you'll be hosted by a cast and crew of real pirates, trained in the arts of debauchery, tequila, and fun. You'll enjoy views of The Arch (El Arco), Land's End, Lovers Beach, and more, as you enjoy the Cabo San Lucas sunshine. Keep your camera ready, because whales or other sea monsters may leap from the depths at any moment! 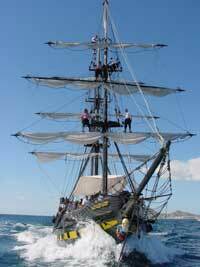 A fun way to see the whales of Cabo San Lucas. Suitable for the whole family. After the tour, photos of you are available for purchase. 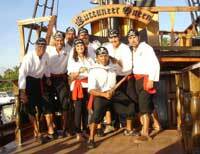 You may also enjoy the Buccaneer Queen by night with the Pirate Adventure at Dusk and the Treasure Hunt snorkeling tour. Daily from 9:00 AM to 11:00 AM. This tour is seasonal and runs from December 15 through April 15 only. The Marina in Cabo San Lucas. Directions will accompany your reservation. All Ages Welcome. Kids price apply from 6 to 11 years old. Kids under 6 years old are free. All Prices are in U.S. Dollars, Per Person. We recommend that you take a seasickness medication like Bonine or 24-hour Less Drowsy Dramamine 1 hour before departure on any boat cruise. It's always better safe than sorry!